The steep terrain and numerous creeks and streams add up to numerous small but picturesque waterfalls within the Great Smoky Mountains. The only waterfalls visible from the road is Meigs Falls which is located 12.9 miles West of the Sugarlands visitor Center. 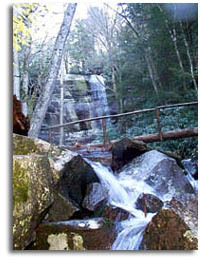 The remaining Falls all require walking or hiking anywhere from .4 of a mile to eight miles round trip. Copyright � 1999 - 2006 Southeastern Outdoors a Division of Southeastern Computer Services.